Members of the Portulaca genus are hardy or half hardy annuals that reach from 15 to 45 cm in height. Portulaca plants carry succulent leaves and bloom from summer to the second half of autumn and carry cup shaped flowers; these may be of yellow, red, pink or white. 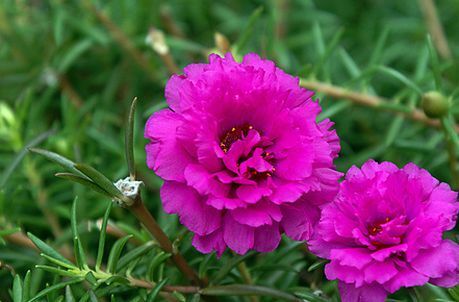 Some of the common names for portulaca include Purslane, Sun Plant, Rose Moss and Wax Pink. purslane is often used for culinary use in countries such as Greece. Moss Rose - Portulaca grandiflora by bob|P-&-S.
Portulaca oleracea - Common Purslane by Pellaea; both photographs under creative commons licence. Common Names: Purslane, Moss Rose (Rose moss), Pigweed, Verdolaga, Little Hogweed. Time flower, Pusley. Life Cycle: Half hardy annual or hardy annual. Height: 8 to 20 inches ( 20 to 50 cm). Native: Americas, Northern Africa, Europe, Asia, Australasia. Flower Details: Yellow, gold, orange, red, white, pink. Cup-shaped. Single or double flowers. Sow Outside: Surface. Following the last frost. Spacing 4 to 24 inches (10 to 60 cm). Sow Inside: Mix seeds in a growing medium, place in a freezer bag, keep moist, then stratify by refrigeration for two to three weeks. Use peat pots. Germination time: one to three weeks in the light. Temperature 75°F (24°C). Seven or eight weeks in advance. Transplant outdoors in the last month of spring. Requirements: Full sunlight. Soil pH 5.5 to 7. Poor soil. Sandy soil. Light poor soils. May become weedy in warm areas, remove plants before they set seed. Miscellaneous: Purslane is a commonly used culinary plant and can be eaten both cooked or raw. It also makes a good companion plant as it has deep roots that can force their way through hard soils; this enables other plants to access previously out of reach nutrients and moisture. Rich in Omega 3, calcium. 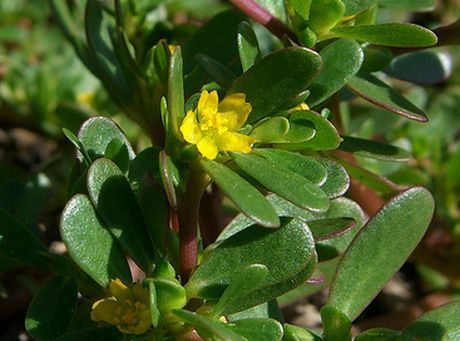 magnesium and vitamins A, B and C.
The seeds of Purslane and other Portulaca members should be sown on the soil surface following the last frost of spring. Ideally Purslane should be grown in a sunny part of the garden and Portulaca genus members thrive in hot areas. The soil that Purslane grows in should be sandy and poor with a pH of 5.5 to 7. If starting Purslane indoors then start about one and a half months in advance. You first need to imbibe Purslane seeds by placing within soil in a plastic bag and placing in the fridge for about 15 days. Once finished, place the soil /seeds in light and germinate at 21 to 30 degrees Centigrade. It typically takes about one to three weeks for Purslane seeds to germinate. Once ready transfer into the garden at from 14 to 60 cm apart (depending on the size of the Portulaca species). This should be done towards the end of spring. Portulaca species such as Purslane require no attention at all when growing and flowering; however you should remove them from the garden before portulaca have chance to set seed as they may take over the garden.